With its all black cabinet and stainless steel trimmed glass door, the Avanti WC1500DSS Digital Wine Cooler creates an elegant display for small wine collections. Soft interior LED lighting illuminates bottles as they lay on slide-out wire shelves. 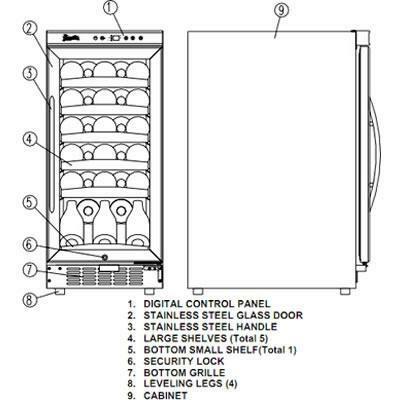 The tempered double pane glass door offers a view of stored bottles while insulating the interior from the ambient temperature. An touch digital control offers settings for red, white or sparkling wine, while the one touch dual function electronic display makes it easy to monitor the temperature. 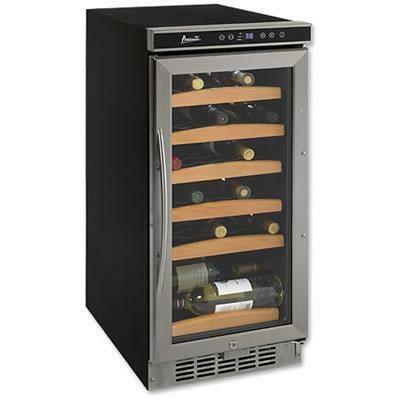 In addition, this wine cooler features auto defrost, an interior fan, a security lock and a removable stainless steel door handle. The wine cooler features both built-in and free-standing capabilities as well as a reversible door, allowing for many placement options.